Kid bean bags by Ahh! Products are perfect for your 3-7 year old child. Comes complete with a removable, washable printed cotton cover made of top-quality fabric. You also get Ahh! Products' exclusive inner water-repellent liner that holds the filling. Both cover and liner are double-stitched to withstand years of use - no more leaking filling. Liners are equipped with child-resistant safety zippers that lock and unlock so parents can open the liner, but curious kids cannot. This soft bean bag chair solves the discomfort of hard, traditional chairs. Shown to help kids focus and encourages reading. Kids with sensory issues, ADHD, and autism have been known to greatly benefit from Ahh! bean bags. 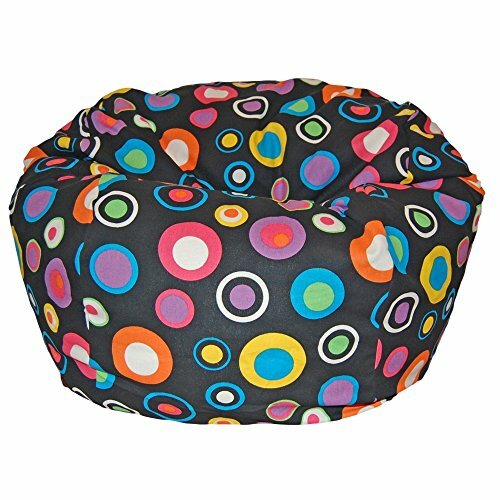 Match it with a LiL Me Doll size bean bag for an adorable set (sold separately). Don't buy a cheap bean bag and regret it, real value is long-term. Filled with polystyrene pellets that vary from 1/8" to 1/2" that are brand new, but re-purposed, making the bean bag "greener". All products are backed by our warranty and are made to last. Warranty excludes compressed filling. Made in USA. Ahh! Products has been a trusted bean bag brand since 1998.